Awarded an exceptional A++ for energy that will keep running costs down, this integrated Bosch KIN86AD30G Fridge Freezer is packed with clever food preservation technologies. With a total net capacity of 257L, this fridge freezer has plenty of room and various useful features to make it an essential addition to any kitchen. Freshsense technology maintains a constant temperature thanks to intelligent sensors. Two separate cooling circuits allow independent temperature control and prevent the transference of humidity between the fridge and freezer cavity, for the best possible storage results for your food. In the fridge are 5 safety glass shelves, 5 door shelves and a HydroFresh drawer which is designed to keep your fruit and vegetables fresh. A SuperCool function is on hand to bring the temperature right down for food that has just been added to the fridge, ideal for when you have just been shopping. The NoFrost freezer in the KIN86AD30G houses 3 transparent drawers, including one BigBox drawer for storing larger or more bulky food items. A SuperFreeze setting brings the temperature right down when you add new food, automatically deactivating when the right temperature is reached. As new food is quickly frozen, more vitamins and nutrients are maintained for a more delicious taste. 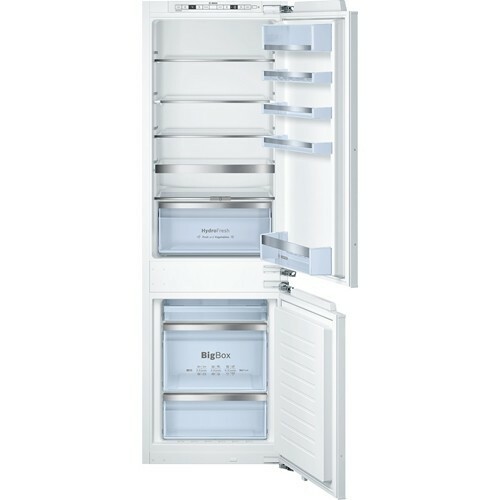 A reversible door makes this fridge freezer adaptable to your kitchen layout, while the removable magnetic door seals enable effortless cleaning and replacement. A warning signal lets you know if the door is left open, or if there is a freezer malfunction.